For about 3 months now, I have been buying pizza stones with the aim of identifying the best one that I may use. Unfortunately, my crave to buy kitchen tools has gotten me to buy both good and despicable pizza stones. I decided to start my search after I realized that I would follow my favorite pizza recipes and still not come up with a pizza like the one I eat at dominos or other pizza places. There’s always something about it. If not, the toppings being half cooked its soggy crust. A chef directed me to change my pizza stone and I can’t tell you just how much I’m grateful to him. I’m here to help you get the right stone, therefore, the right pizza at home. What Is Pizza Stone and What Is It Made Off? Pizza stone basically refers to the round or rectangular slab of stone where you place your pizza. In cooking it on the stone you attain the crunchy texture with the soft beadlike interior. If you will have the right stone, know how to add the toppings and baking it, you won’t need delivery services anymore. The pizza stone is often made using cordierite because it distributes the heat evenly without burning it. Cordierite is further durable and you will rarely find it cracking. 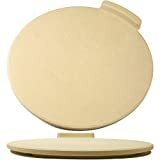 This pizza stone falls under the ceramic stone category although they possess some even stronger aspects. Cordierite is lead-free and non-absorbent. It’s best when it comes to thermal conductivity. It will handle even the extreme temperatures with ease. This means that it won’t break easily even if you took it from the hot temperature directly to the cold one. Clay happens to be the most popular when it comes to baking stone. The aim is to ensure it delivers the same quality that the brick stone oven has. This may be attributed to the fact that the clay pizza stone is great at delivering a crispy texture. It does so by absorbing all the heat from the oven then and then pass it to the pizza you are cooking. This makes it easy for the pizza to bake on the heat source that is producing the right amount of heat and a temperature of 500 degrees. It then gets rid of the moisture from the dough to earn the restaurant style pizza. This pizza stone is often baked in fire which makes it feel as though it’s made of bricks. You will even have those that are made using the clay and cordierite. Such are stronger and effective. They will come in different sizes and shapes. But it takes a long time to preheat and its hard to clean. Clay is often brittle so it may break easily. Ceramic is another material that they use on the pizza stone although it cracks easily. Nevertheless, it works best for those who have just recently started baking pizza. They are easy to take care of and you only need soap and water for its cleaning. If you like the pan type pizza then this ceramic stone is quite effective. Understand that it has a problem with conductivity in comparison to the two above. They are further light and easy to move around. Some people use cast iron for the pizza stone. Cast iron is just the iron-carbon alloys. The reason why people love them is that they have a low melting point. They are further mostly flexible with handles on both sides. This makes it easy to move the iron from one part to another as long as you wear your gloves. Cast iron heats up faster than the clay pizza stones. Moreover, you may even use it on the grill and griddle. You can even use iron skillet since they are readily accessible. Another piece is the lodge cast iron which heats up quickly. It’s even easy to clean than the normal stones. You further won’t hear of breaking or cracking. On the downside, cast iron pans like lodge cast are not as effective as it only works to a temperature of 400 degrees in the oven. Baking steel were the recent ones to join the list of stones you may use for baking your pizza. Steel is quite similar to cast iron although it burns quicker than the cast iron. They conduct heat quickly and they will cook your pizza even at the lowest temperature. For effectivity, most chefs ask that you place the pizza stone in the oven for about an hour before you put on your pizza. This helps to speed up the cooking process since the stone is already preheated. As you can see discussed above, you ought to know which type of pizza stone you would like. This is especially so because as you can see you have those made using cast iron, steel ceramic, cordierite and clay. You will choose the stone based on the number of times you intend to use the item. For example, if you will only use the stone in the oven then the cordierite is the best option for heavy use. This is because it’s never affected by extreme temperature and its further break resistant. Other options you may go for include steel or cast iron if you are going for heavy use. For the moderate use, you may choose the ceramic option. Also, when you wish to make an authentic pie still consider the use of ceramic and clay. Just know that steel is the modern tool that heats up fast while maintaining the heat. Remember the budget you have set for the items matters as to which one you can take home. This stone type has different sizes as well as weights. Size also determine the prizes. Note that they all have a diameter of between 10inches and 16 inches. 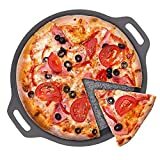 Steel pizza stone: it usually has a size of between ¼ and ¾ inches deep. The quarter inch one weighs about 15 pounds and you may add 15 more pounds with every quarter inch increase. Cast iron: this one ranges from a ¼ inch to ½ inch and the weight can be anything from 7 to 10 pounds. Stone make: it often has a height of 1 inch and it ranges from the ½ inch to 1 inch deep. It will weigh around 10 pounds. Ceramic types lack the depth measurement and they weigh from 5-7 pounds. Of course, the stones don’t only make round pizzas even though it’s the most common type. You will have round, square and rectangular shapes. The round model is yours if all you want is to make the pie. However, if you will use the stone for other purposes other than making the pie than you need the rectangular one. This is because it provides more surface area to even cook more than one pizza. If it has the handle the better because it makes operating it easy. Its movement from the oven to the kitchen working space is easy. It, in fact, reduces the strain on your body. It’s an ideal feature for anyone concerned about the movement. Cast iron is the only one that will come with a handle. You can either have the stones being glazed or unglazed. You have most stones being unglazed since it uses the feature to soak up moisture during the cooking. Other models even have the micro glazed finish. This means that it allows the moisture to seep through cracks. The glazed versions are further advantageous because you may cut your pizza on the surface without scratching its surfaces. The problem with unglazed surfaces is that they are harder to clean as the pizza may stick on the surface. However, if you use the cleaning spray then the process shouldn’t be tedious. It’s the work of the manufacturer to list the glazed stone as a non-absorbent one. Always make sure you know the size of your oven since not every stone will fit in your oven. You will know this when you measure the cavity of your oven’s depth and width. If you have a gas oven you ought to leave some space on either side of the oven to ease the circulation of air. How well do you like pizza or bread? You will want a thicker stone if you love your pizza being evenly cooked. Let it be ¾ to 1 inch thick. If you have a thicker stone, your pizza stone will absorb more heat and moisture. It further allows for better distribution of heat in the toppings and food. This will then give you an even baking. The largest stone is usually 16 inches by 14 inches. This comes in as the largest pizza stone available. It’s a 14×16 inches pizza stone. This is a stone of goodness since it’s made using the oldest and traditional material-cordierite. 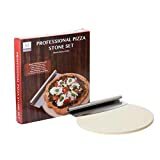 It doesn’t matter whether you are cooking your frozen pizza or making your own dough, this pizza stone must give you the evenly cooked crust that is also nicely brown. This is a result of the quick and even heating of your pizza. The material will last longer while being effective. Understand that this is quite large and it might even be larger than your home oven. To be on the safe side, you should measure your oven before buying the stone thus making sure it will fit in. Ts flat surface area is ideal for baking other desserts and even bread. In fact, the fact that the stone is made using cordierite makes your desserts feel like you are baking your food on the brick oven. The consequence is that your desserts have a brick like taste. These 16 inches round built pizza stone is the answer to your problem with constant breakage. It has a highly absorbent surface to extract all the moisture from the pizza. It takes on the restaurant style of pizza and pie. One thing is standard and it’s that as long as you use the correct recipe it will attain its deliciousness with the perfect crunch. Made using cordierite, it can stand a temperature of 1500 degree and still deliver the perfect results. Since its never affected by temperature you can expect it to serve you for many years ahead. This stone knows to subject the heat to the core then concentrate it outside for your crusty exterior. This is a thicker brand, therefore, it provides more heat retention and its further breakage resistant. Since its bottom has a ledge, the item is easy to handle. you may use it on the grill surface or in the oven. This item then comes with a manual to instruct you on how to use it in order to reap all the benefits. What’s more, you will receive 108 pizza recipes for you to try today. It’s no spill stopper is ideal to stop the pizza pie bread or other desserts from sliding at the back. Another one of the many ideal pizza stones that is originally from France. The item is micro glazed which means it will still absorb some moisture. You may use it in the oven and grill as well. The one thing about it is that it will deliver the crusty pizza without your surface developing stains. This surface further prevents your stone from wearing down. You are allowed to cut the pizza on the Emile surface since it can never scratch it. 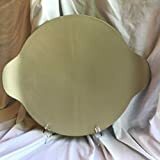 Consider the fact that the item comes from Emile Henry manufacturers who are popular for making ovenware, bakeware and gourmet cooking products using the high-quality ceramic. This is to say you expect nothing short of the best from this item. You can use it on charcoal gas and natural wood grills as long as it will only reach 900 degrees. You can use it in all oven kinds and broilers. It’s among the few stones that have handles to ease the movement of the item. Your pizza will slide off easily once it’s cooked. This one features a clay made pizza stone that is eventually finished by hand. Unlike most pizza stones, it has the handles for easy movement. This one serves you with less effort and you still acquire the restaurant style pizza. These pizza stones require that you pre-heat them for a short while before you can place the pizza over the pizza stone. However, the pampered stone requires no preheating it heats up as soon as you place the stone in the oven. It just takes your pizza 5 -10 minutes to get ready. This tool is ideal for use in restaurant setups. The item is also micro craze glazed which means that it absorbs some moisture while delivering a crusty pizza. It’s actually a non-porous kind of stone but which is easy to clean. It’s ideal for that individual who is in a rush to finish cooking. On the downside, most people believe that it’s not ideal for you if you will use it frequently. Another one of the best pizza stone for your grill surface use. It’s actually a ceramic type of stone that will distribute your heat evenly. It is further able to pull off moisture from the dough and the oven with the aim of giving you a crusty crust. This one is designed for use on the big green egg grill. You may have varying sizes that suit all your ovens. Notice however that when you are using this item you need a convEGTor accessory. Its work is to diffuse the grills direct heat for indirect cooking. This is the kind of heat you need to make the pizza or other desserts without burning it. Consider using it to grill your bread and other pastry. It further has the ability to retain heat thereby keeping your food hot for longer. This 14 inched item will fit the large big green egg. I like that the pizza attains a nice brown color and a brick oven kind of crustiness. Use this pizza stone to make the restaurant-style pizza at home. Whether you are looking to make the dough afresh or reheat your pizza, this is the ideal stone to have. You won’t regret buying this premium ceramic pizza stone. This pizza maker works for your 13-inch pizza since it’s a 15-inch round piece. It’s further a nonstick pizza that has no toxins. It’s easier to clean than most because you just wipe its surface with warm water. The ceramic pizza stone can cook your pizza up to a temperature of 450 degrees. Although ceramic is said to break easily, if you will take good care of it then you don’t expect it to break anytime soon. The rapid temperature change may affect it. So, as you are preheating your oven consider the temperature of the stone. This is another one that comes with handles which you can use in both the oven and the grill. You may use it with your standard charcoal and gas grills. You may further use the stone with a number of desserts aside from pizza. 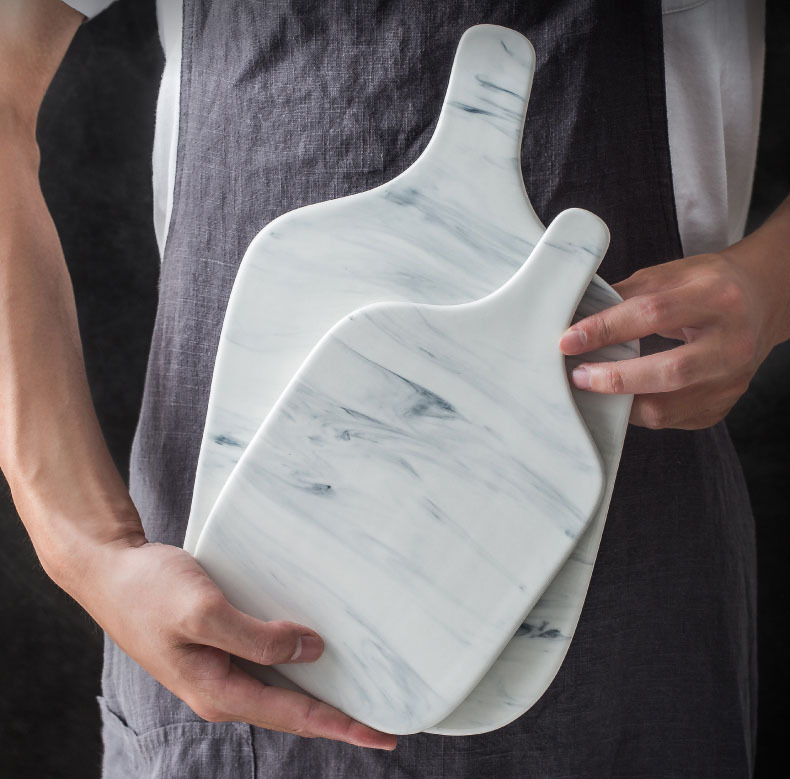 If all you desire is a restaurant style of pizza then this ceramic stone has you covered. It will take a shorter time to preheat not like most other pizza stones. Since it’s a nonstick stone, the pizza won’t stick from grease. It’s a large 15-inch round pizza stone that means you should confirm the size of your oven before you buy one. Made of ceramic the item evenly distributes heat to attain the crusty texture and nice brown color. There’re further no restrictions as to where you ought to use the stone. You can use it in the gas oven, grill and BBQ. Since ceramic material makes it nonstick your pizza won’t stick on the surface of the stone. It smoothly slides out. This makes it easy to clean than the unglazed types. It doesn’t even smoke and it’s odorless. You may use it to serve since its sleek and stylish. As a bonus, you are given the pizza cutter. You further have a lifetime guarantee with the item. If you are looking for the high-quality craftsmanship in the stone then this matching stone will serve you just well. The stones are closely monitored during the manufacturing process to ensure that the item reaches the high quality it should. Use this stone to make a professional pizza at home. The stone is versatile so you may use it to make bread and other desserts. What’s more, you may use it in all home ovens, charcoal, smokers and gas grills. It releases no odor yet it’s designed to stand a temperature of 1100 degrees. The stone is further thicker than all the other stones. This is ideal for even heat distribution which produces the uniform crust that is also golden. This stone meets the set FDA standard among other standards across the globe. This pan is made using granite which is a pure natural stone. It is usually not only strong but it also has strong thermal stability and high material density. With these qualities, it describes a stone that is durable and can stand very high temperature. It’s further nonstick with low permeability. The minerals it has are beneficial to human health. The stone is flexible since you may use it as a pan for your bread and pies, pizza stone and even grilling stone. Use it to make grilled steak and it gets you hooked. Since it produces no odor you may use it in the house or for your outdoor activities. Since it’s manufactured using pure stone from a single quarry, you can use it on your open fire or barbecues. It only has the stone and aluminum oxide. It’s further lightweight and with the handles, you can easily move it from one point to another. It’s easy to clean its surface because it’s coated. Its 11-inch diameter suits a moderate pizza that you would eat at home. The nerd stone has a high heat transfer ability. It will transfer heat 20 times faster than your regular ceramic. It features the steel material with great heat retention to deliver a great crust. You can actually use it in a 1000 degrees temperature in the oven. With the stone, you will have an unparalleled cooking performance. 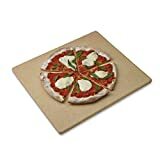 The stone has a low friction texture but worry not because you need such texture to deliver a nicely colored pizza with crusty texture and beadlike interior. The surface is normally seasoned with flaxseed oil to aid in the natural and easy release of your pizza once its cooked. The two finger holes aid in its movement and you can hang it on the wall. It doesn’t limit you, so you can use it on all kinds of cooktops including the induction cooktop. You can even use it over an open campfire. Since it’s a 16 inched pizza stone you have plenty of room to make your family size pizza. This stone will develop dark patina over time just like the cast iron surface. You must store it dry to avoid rusting. Another stone that you will use to blow your friends and families minds away. The pan has a larger surface area although it still fits your home oven. You can further use it on the BBQ, and grills. The exclusive heat spiral will heat your stone quick then retain the heat at the center. This will allow you to cook both the toppings and crust in the middle the same way you are doing at the edges. This item works to reheat your pizza as well. The heat spiral together where the crafted feet under the stone will keep your stone balanced thereby giving it a firm grip to ease its movement. The stone can stand extremely high temperature of 2000 degrees without cracking. Another one of the best pizza stones made here in the US. It looks good yet it serves you well. At 21 inches the pizza stone is meant for industrial use. It’s durable as it can stand high heat. This one is rough and rugged to help deliver a high-quality pizza. The company is concerned about delivering a greatly textured pizza with even color. It features a high grade of the nontoxic mullit and a high grog quantity. It’s therefore resistant to thermal shock. It being unglazed makes it porous enough to absorb your pizza moisture. The stone is made using natural granite and you will agree with me that its eye-catching. The stone used in this case is quite heavy and for that reason, it retains heat enough to perfectly cook your pizza. When you place your pizza on this natural stone that is sourced from the single quarry, its temperature doesn’t drop. The stone’s surface is nicely polished to make it work as your cheeseboard. Before you begin cooking with it, let it preheat for about 30 minutes. It will work at a temperature of 500 degrees only remember to use the semolina to avoid sticking of the pizza. It’s a heavyweight piece and will allow you to cook on its 14 inches surface. This is one of the few cordierite pizza stones. Its aim is to absorb all the moisture from the pizza in order to have a light and crispy crust. It’s made with the Weber gourmet grill design in mind. It should fit on the gourmet for easy grilling. It has handles on either side of the stone to make it look like a serving tray. But in essence, it helps in easy movement. You must let it preheat at a temperature of about 500 degrees for 30 minutes. The 30 minutes will help your pan absorb enough heat from the oven to keep the pizza crusty. Therefore, it will cook your pizza in minutes of placing it on the stone. Regardless of the temperature in the oven, the stone is hot and cooking your pizza already. Consider the fact that the gourmet stone is durable and for that reason, it is more expensive. Since it can stand high and extreme temperature, you can use it both in the oven and grill. Last on our list today is this heavy-duty pizza stone. It’s made using the cordierite stone which doesn’t release odor as you are coking. It can stand a temperature of about 1450 degrees. This is to say that not only is it heavy-duty but it won’t break anytime soon. 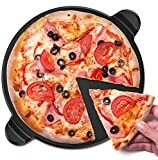 The large pizza stone will cook a large pizza for your family. But what’s even better is that it retains its heat in the 5/8 inches thickness and 6.6 pounds. 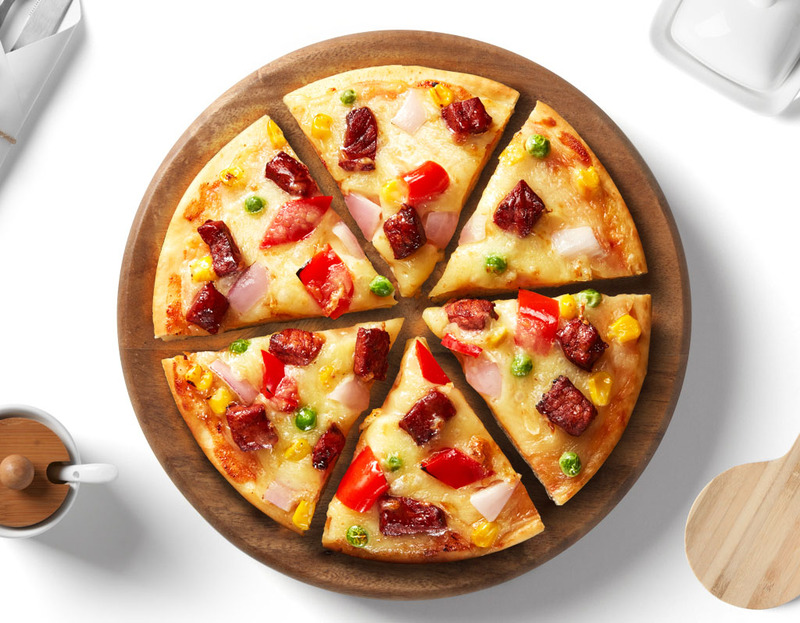 This means that all the pizza from this item has a great crispy crust and nicely cooked toppings. This heavy-duty stone comes with its scraper to help in the scraping of the pizza particles remaining. You must sprinkle some flour when you are laying the pizza on the stone to avoid sticking. This item will cook both your frozen and fresh pies.